Most trophies take the shape of a cup, goblet, or maybe the side of a mountain. For this weekend’s Battle For The Stones, Capcom has opted for a giant replica of Thanos’ gauntlet, complete with light-up infinity stones. The game (Marvel vs. Capcom Infinite, as we are reminded by the commentators’ backdrop) is all about infinity stones and using them to do crazy combos. 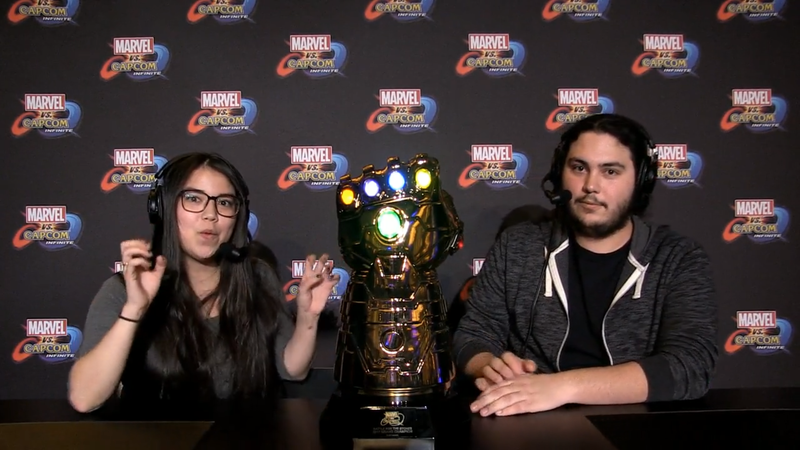 The tournament itself even encourages their use, giving players who won certain events an “infinity stone” they can use during the tournament to hopefully change the outcome of their match. The grand finals between Jonathan “Cloud805" Morales and Christopher Gonzales, or “NYChrisG,” kick off tomorrow night at the PlayStation Experience. Both winners should probably take some measurements so they can figure out whether they have the real estate to house this behemoth of a trophy.